is available for download from the Android developer site. To recap, the NDK is a companion to the SDK that provides tools to generate and embed native ARM machine code within your application packages. This native code has the same restrictions as the VM code, but can execute certain operations much more rapidly. This is useful if you're doing heavy computations, digital processing, or even porting existing code bases written in C or C++. The ability to use OpenGL ES 1.1 headers and libraries If your application targets Android 1.6, your native code can now directly call OpenGL ES 1.1 functions to perform graphics rendering. This will help those programs that need to send large amounts of vertex data to the GPU. Note, however, that activity lifecycle and surface creation must still be performed from the VM. This NDK contains a new sample ("san-angeles") that shows exactly how to do that with a GLSurfaceView object. The ability to target either Android 1.5 or 1.6 devices The NDK parses your project's properties to know which platform release it is targeting. It will then automatically use the proper headers and libraries to generate your native code. Any application that targets 1.5 will run on Android 1.5, Android 1.6 and any future official system release. Targeting 1.6 should, thus, only be done if your application requires new 1.6 features / APIs, like the ability to call OpenGL ES 1.x headers from native code. The ability to put your native sources under your application's project tree You can now conveniently place all your sources (C, C++ and Java) under the same tree, for editing or version control purposes. Many fixes to the NDK's build scripts The changes to the build scripts fix some annoying bugs and also increase host system compatibility. If you have any questions, please join us in the Android NDK forum. 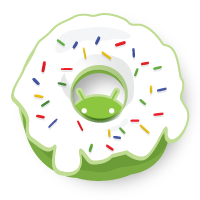 Today Android 1.6 NDK, release 1 is available for download from the Android developer site. ADC 2 Judging Has Begun! 's first round of judging has begun! As a reminder, user voting determines which apps will make it to the second round. Voting will occur through an application called Android Developer Challenge 2, which is now available for download from Android Market. Android Developer Challenge 2 presents apps for each user to download and score according to a set of criteria, such as originality and effective use of the Android platform, among others. The first round of judging will last at least two weeks from today. Judging will continue until we receive a sufficient number of votes to identify the top 20 applications in each of the 10 categories (200 apps total) that qualify for the second round. During the second round, judging will occur through a combination of user voting and input from a panel of industry experts. User voting will continue to occur via Android Developer Challenge 2 and will account for 40% of the final score that each app receives in round two. The remaining 60% of the final score will be determined by the industry expert panel. It has been a little less than a year since the first Android-powered phones became available. Today, there are more than 10,000 applications available in Android Market. We are pleased by the energy and commitment demonstrated by developers in such a short period of time. Our goal with Android Developer Challenge 2 is to inspire the developer community to produce even more innovative apps for Android. Now on to the voting! I am happy to announce that Android Developer Challenge 2's first round of judging has begun! We have also added four new sub-categories for applications: sports, health, themes, and comics. Developers can now choose these sub-categories for both new and existing applications via the publisher website. Finally, we have added seller support for developers in Italy. Italian developers can go to the publisher website to upload applications and target any of the countries where paid applications are currently available to users. To take advantage of the upcoming Android Market refresh, we encourage you to visit the Android Market publisher website and upload additional marketing assets. Check out the video below for some of the highlights.